I have always prided myself on being my close family’s Champion Builder of Sandcastles. This is not to say that I am unaware of the sterling sandcastle building qualities of other relatives. 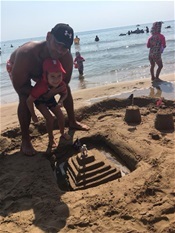 My brother-in-law (Mr B’s Little Bruv - they are like peas in a pod) fashions fairy castles crouching down where sea meets sand and letting wet sand drip through his fingers as he builds each magical turret and tower. My own Little Sister, like me, cannot venture onto a sandy beach without immediately setting to and constructing yet another Sandy Edifice. To my own immediate family, however, I am the Expert, having indoctrinated them into believing this since the very first time they tipped a full bucket of sand upside down on the beach, patting it three times with a spade, for luck, before lifting the bucket to view the results of their earnest endeavours. Yes, my dears, I would tell them, you are getting the idea - now let’s build the Biggest Sandcastle in the World. It now seems, judging by the holiday photographs I have been receiving, that I have been toppled from my Sandcastle Eminence, usurped in my absence by Another. It is a sobering thought. Every one of My Foursome has either been on holiday or is currently on holiday - and it is fascinating to see the difference in the subject matter of their holiday snaps. The Eldest of the Darling Daughters and her family have clearly enjoyed an action packed holiday as usual. If they have visited the odd beach, then that hasn’t made it into the cut when the decision about which photos to send me was taken. But here they are on a boat, astride horses, on cycle rides. The more adventurous, the better for that family. The Youngest of the Darling Daughters sends lots of scenic snaps of beautiful beaches, a sunset or two, and pictures of her fella and their grown-up kids fooling about in the swimming pool or the blue, blue sea. I gain an impression of a relaxing, mooching about type of holiday. Though, yes, they take a boat too..
My Boy and his family have only sent a few photos as yet but I can guarantee that their snaps will be mostly beach-based. There is bound to be a boat, too, but it will be built of sand near the edge of an incoming sea so that, once constructed, my three (Not So Very Little) Welsh Boys will be able to attempt, in vain, to hold back the tide before seeing their boat succumb to the waves. They never seem to get upset about the forces of nature, knowing as they do, that - holidays being what they are - there will almost certainly be another boat-building exercise tomorrow. It is the pictorial record from the Middle of the Darling Daughters that gives me cause for concern that my long reign as Castle Building Supremo is coming to an end. My Algerian son-in-law, father of the Trio of Rampaging Rascals, appears to be producing a spectacular new castle every single day. Today it was a Jurassic World Kingdom for Faris; tomorrow he has promised Elsa’s Castle for Lilia. You have to admit he is quite remarkably ambitious. I can’t hold a red, plastic spade, let alone a candle, to him when it comes to the Building of Sandcastles. One thing does puzzle me: by what magical means does he stop the Rampaging Rascals, well, rampaging all over his creations when they are but half-built? The sandcastles, I mean, not the Trio, don’t be silly. I am remembering our recent Family Beach Day when, even with the stalwart help of grandson Jack, we couldn’t complete our Big Build. I am also thinking back to the far-off days, before My Boy was born, when my eldest two daughters set out every day on our seaside holidays to build “a hundred sandcastles” only to find their baby sister following behind them flattening each and every castle as soon as it was built, with a well-aimed swish of he spade. “He’s Daddy!” the M of the DDs reminds me, “He just says ‘Don’t go near!’ and they don’t.” Oh, to have such power! I can’t wait to see a picture of Elsa’s Castle tomorrow - but, in order to keep up with the other three families, I challenge the Usurper to build a boat next. Why do I have a feeling that, if he accepts the challenge, he will be producing a sandy version of the Queen Mary?